Petros can support the development of the horse rider combination by taking on some of the schooling of the horse. It may be that a young horse can benefit by a more experienced rider or that the rider does not have the time or expertise to do the necessary work with their horse. Petros is happy to work both on the flatwork as well as jumping. Cross country training is also a great pleasure. 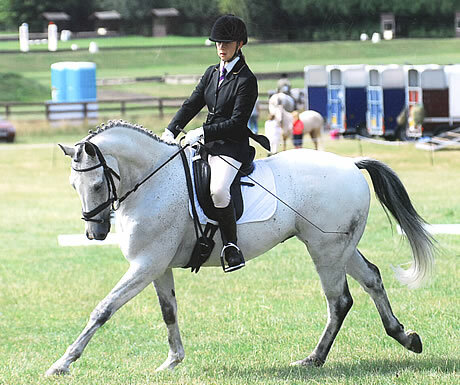 Petros is available to work with you and your horse at home as well as at competitions. Occasionally riders experience difficulties having bought a new horse and need assistance in ‘gelling’ together and settling into a partnership. Petros can support this process and help you make the right decisions, developing a suitable training plan. Lungeing, long reining and ‘in hand’ work are also useful tools in training horses and Petros can enable you to improve your skills and your horse’s knowledge in this area. Correct training on the flat makes a horse much more pleasant to ride in which ever discipline you want to concentrate, competitive dressage, jumping or just for pleasure hacking out. The guiding principles of the ’scales of training’ that the German federation formalised many years ago and are now adopted more and more extensively in this country, form the backbone of my training approach. I always adhere to the ideal that one has to establish sound foundations of knowledge on which to gradually build on, never attempting to rush a horse into the next stage of education before he is confident and established in the basics. Most issues of performance at the more advanced work can and should be solved through returning to the basic work and checking that it is still clear and correct and then re introducing the more complex movement/ exercise when the horse is ready to ‘let you in’ and allows the aids through. One of the critical issues for the rider is to know when to ask for more from their horse and when to give the horse space to just be and relax within himself. A horse that is willing to carry his rider forwards calmly, in a regular rhythm and also willing to wait when asked is one of our first objectives. Equal lateral flexibility so that the horse is happy to work in both left and right position equally well is also a priority that needs to be addressed over time, with great patience and perseverance. One must be very cautious not to ask for too much from the horse when he is not ready physically or mentally to perform that particular movement or exercise. In particular excessive collection must be avoided at all costs because the result will otherwise be resistance, negative tension and attitude from the horse. These foundation blocks are part of the model that Petros employs in nurturing the horse’s confidence in its rider and enables the progression to more advanced work while maintaining the horse’s willingness to learn and to please. In training horses Petros takes a holistic approach that considers the whole experience of being and identifies the natural strengths and the weaknesses in performance ability. In designing a program of work that suits the individual horse he utilises the things the horse enjoys doing the most to help him tackle the trickier areas of work. Often a mixture of exercises is needed to achieve the desired outcome, for example gymnastic jumping exercises combined with appropriate flat work can have fantastic positive impact on the horse’s athletic ability. Petros always looks for the best possible way to improve the jumping technique over all the different types of jumps while paying particular attention to the quality of the paces and the rhythm between fences so that the optimum performance can be realised and success over any course can be attained. The vast repertoire of exercises that Petros utilises ensures that the appropriate balance of work can be maintained so that the horse remains willing and interested in his work avoiding boredom issues. A lot of preparatory work for cross country riding/Eventing can be done in an arena or field at home. 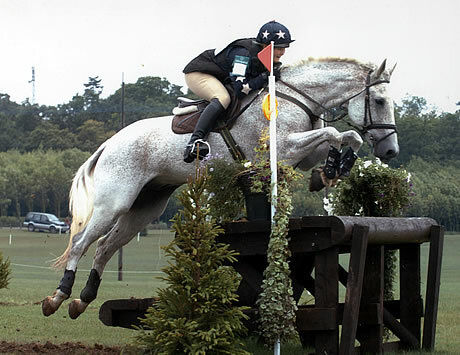 Using show jumps one can construct ‘skinnies’, set angled combinations or related distances, practise corners and arrow-heads. Petros’s imaginative and creative designs prepare the horses (and their riders) so that they can confidently take on the demands of the cross country phase. Great care of course needs also to be taken to ensure the horse is adequately fit for the task that is going to be asked of him. A fitness regime can be scheduled in the training program so that by the time the first event is due both rider and horse are well prepared.